Beer doesn't contribute much to your diet; certainly, milk or juice would be better choices if you're looking for nutrients. But sometimes you just want a cold brew. It never hurts to know the details of what you're putting in your body, even if it's a very-low-calorie option such as Beck's Premier Light. A 12-oz. bottle of Beck's Premier Light has just 64 calories, compared with around 100 calories in most light beers and 150 in regular beer. 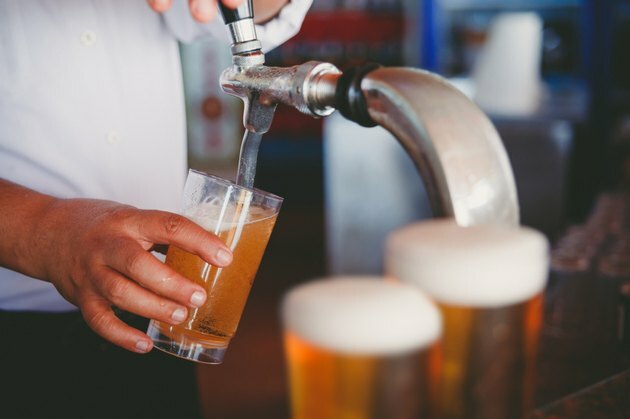 The number of calories is related to alcohol content; regular beers in the United States are about 5 percent alcohol by volume, and light beers are about 4 percent. Beck's Premier Light is 2.3 percent alcohol by volume. Like all beer, Beck's Premier Light has no fat. It contains 3.9 g of carbohydrates in 12 oz. ; these make up about 24.4 percent of the total calories in the bottle. They also account for 1 percent of your recommended daily intake of carbs. None of the carbohydrate calories come from fiber. The only nutrient found in Beck's Premier Light is protein, with 1 g in each 12-oz. bottle. That's 2 percent of your daily value, and 6.2 percent of the total calories in the serving. There are no significant amounts of other vitamins or minerals. The connoisseurs on the website of "Beer Advocate" magazine weren't impressed with Beck's Premier Light, grading it with a D and urging drinkers to avoid it. They often used words such as "watery" and "skunky" to describe the taste. On the other hand, the Beverage Testing Institute gave it 84 points for a "recommended" classification and notes flavors of bread dough and potassium chloride. Beck's Premier Light hit American grocery stores in March 2005, and for a while wore the crown of lowest-calorie beer available in the U.S. But several other big players jumped on the low-cal bandwagon in 2009 to challenge the title. MillerCoors introduced Miller Genuine Draft 64, which matches Beck's 64 calories per 12 oz. Anheuser-Busch InBev came up with Select 55, and as its name suggests it has just 55 calories per serving. These are 2.8 percent alcohol by volume and 2.4 percent, respectively. Food Inc. on MSNBC.com: Is It Beer-Flavored Water or Water-Flavored Beer?